This book provides a wealth of practical "how-to" guidance for all who are interested in, planning to engage in, or actively involved in setting captives free from evil spirits. 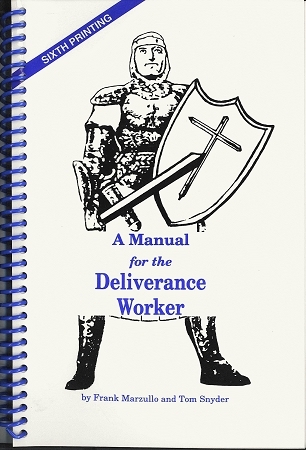 This book provides a wealth of practical "how-to" guidance for all who are interested in, planning to engage in, or actively involved in setting captives free from evil spirits. Mature men in Christian ministry are rich sources of wisdom and understanding. Through preaching, teaching and writing, knowledge gained by their study and experience is passed down from generation to generation. Frank Marzullo has a proven ministry in deliverance and spiritual warfare. He is widely respected for his Biblically based teaching and for his anointing from God. Wise students and fellow laborers can learn much from his wisdom and experience. Tom Snyder, Frank's son-in-law, is another "Timothy" in the ministry. These men have united their understanding and their ability to communicate to bring forward this great contribution to the ministry of deliverance.